The Alpine Convention´s Soil Conservation Protocol (SCP) provides a comprehensive basis for soil protection. The protocol is already largely implemented into national legislation, but not in all countries and not satisfyingly for all topics and levels. It is still rather neglected in many countries, especially by public administration, local policymakers and society. Especially in the Alps, soil conservation is crucial, because of the limited amount of usable area in mountain regions. In addition, the severe risk of erosion on slopes, underlines the special vulnerability of Alpine soils. 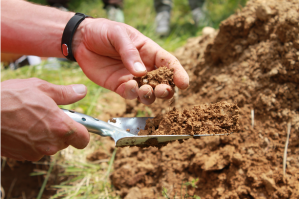 Therefore, strategies for soil protection and soil management, which are suited to the specific topography and the diversity of Alpine soils, soil functions, and services, are essential. The SCP of the Alpine Convention provides a comprehensive basis, but there are still major deficits within its implementation. The datasets of both surveys were merged. From each country with no or weak response in the 2016 survey (Badura et al. 2015), between 9 and 25 experts shared their knowledge within the new survey. The combined results allowed us to draw some general conclusions for the whole Alpine region. Thereby, the main purpose was to identify what hampers an effective implementation of the Soil Conservation Protocol and therefore the steps required for its future promotion. In summary, around 15 years after signing the SCP it is quite well established but yet there is substantial need for effective implementation.